Students at Emerson J. Dillon Middle School recently spearheaded a food drive to benefit the Oswego County Animal Welfare League. 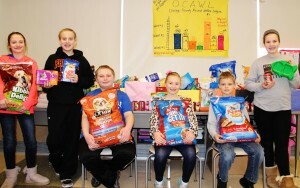 Emerson J. Dillon students (from left) Julianna Lewis, Madison Watkins, Brian Gibbs, Chloe Coughlin, Sean Stevens and Caitlin George proudly display some of the supplies and food items that the middle school students collected to benefit the Oswego County Animal Welfare League. The idea sprung out of a discussion among EJD Student Council members who were considering different projects that could positively affect the community. After hearing stories about local pets being abandoned, abused and malnourished, the students wanted to do something to help. Students answered the call for help, and in just three weeks they had collected enough food, supplies and money to fill dozens of boxes for OCAWL. More than $740 in supplies and cash donations were collected, including blankets, toys, food, paper towels, dryer sheets, laundry detergent, soap, dog beds, kitty litter and more. The supplies were packed into a vehicle and dropped off at OCAWL headquarters. According to George, the donation effort was just another example of the giving spirit embraced by Phoenix middle school students.